So meanwhile, as a sort of placeholder, please peruse the following humor piece I wrote many years ago. To demonstrate how many years ago, it references Older Daughter going to summer camp (that was in 2010). It's also guaranteed to tick off a bunch of small dog owners, so I apologize in advance. Satire, folks – remember, it's satire. Great big dogs. The bigger the better. Show me a Lab and I'll want a Malamute. Show me a Malamute and I'll want a Newfoundland. Show me a Newfoundland and I'll want an Irish Wolfhound. Show me a Wolfhound and I'll want an English Mastiff. I'm not sure there's a breed bigger than a Mastiff, is there? But if there was, I'd be interested. Now doubtless some psychology types would have a hey-day with this bit of information. Likes Big Dogs, does she? Oh, she's just compensating for being short (or something like that). Yes, I'm short. But no, I'm not trying to "compensate" for anything. I just like Big Dogs. Oh, and hairy too. Big and hairy, that's how I like 'em. 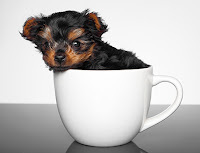 But some weirdo-types like the opposite: they go for Small Dogs, the smaller the better. Show them a Beagle and they'll want a Yorkshire. Show them a Yorkie and they'll want a Pekingese. Show them a Peke and they'll want a Pomeranian. Show them a Pom and they'll want a teacup Poodle. Open any issue of your local PennySaver newspaper and turn to the Pets section, and you're likely to see dozens and dozens of ads for Chihuahuas (beastly little critters). If there was a dog breed the size of a rat, I'm sure it would be more popular than chocolate. And some of these Small Dog lovers have even been known to dress up their Little Dogs like ballerinas or Darth Vader or dolls. Gack. I call these rat-like creatures Blender Dogs (more on this later). See, to me a dog must have substance. Dignity. Presence. Purpose. Of what use are those tiny little yappy things except to offer temptation to boot them across the yard? (Not that I ever would – please don't misunderstand – but it's just so tempting.) Yeah sure they can climb onto your lap, but then so does my Big Dog. I just can't breathe when she does it. And above all, you'd never find a Bull Mastiff or a Newfoundland dressed up to look like a ballerina or Darth Vader or anything. Why? Because to do so would be an impingement on their dignity. Besides, they're usually bigger than you and can convince you that your attempt to fit them into a Darth Vader costume really isn't in your best interest. So yes, Big Dogs are more suited to the wider spaces of country living. Let's face it, a Yorkie would be bobcat bait if left out in a rural yard for any length of time. We have owls who would snap up Chihuahuas for appetizers. And it's my suspicion that a coyote would jump the fence and snack on a Pomeranian or Pekingese just to shut it up. Because little dogs yap. Oh my goodness, they yap. They yap and yap and yap. They never shut up, in fact. We know some people with a Pomeranian and they actually have to squirt him with water to shut him up enough so we can hold a conversation. We own a Great Pyrenees, a dog with dignity, presence, and purpose. My Pyrenees doesn't yap. She barks, thank you very much. Loudly. Deeply. A gruff, dignified bark. She barks and barks and barks. But see, she barks for a reason. She's barking with dignity, with presence, and with purpose. She is defending her flock (us) from those evil awful turkeys that occasionally strut down the driveway. Or she is protecting us against the wind. Or robins. Or fluttering leaves. See? Dignity. Presence. Purpose. All the difference in the world. And if, heaven forbid, we leave the house ... well, she is inconsolable. Her flock has escaped! She has failed in her purpose to guard us! It is most distressing to her. But let us come home or even get out of bed in the morning and she is incandescently happy. She will jump up and down in delight. She will caper around the room. She will attempt to climb into our laps in ecstasy. Her flock is complete! Her mission is accomplished! Her purpose in life is fulfilled! But if one of us is gone ... she is worried. There are wrinkles of concern on her forehead. This week, for example, our older daughter is away at summer camp. This means our Pyrenees is upset. A lamb is missing! She is failing at her mission! She keeps putting her nose under our hand, seeking comfort in her distress. She feels responsible and at fault because one of her flock has strayed. It's like she's trying to apologize for letting our older daughter escape from her watchful guardianship. See? Big Dogs. Purpose. Dignity. Presence. Whereas Little Dogs do nothing but get underfoot and yap in a voice shrill enough to shatter glass. Don't you just want to boot them across the room? I know I do. And Little Dogs can be vicious monsters. Perhaps because of their size, no one ever attempts to train Little Dogs, and so Little Dogs grow up thinking they're Big Dogs. They snarl and snap and growl and bite. They think they're the biggest, baddest canine on the planet (which is why it's always amusing to watch a Chihuahua meet a Rottweiler). And most owners don't attempt to rein in this little terror because, gosh darn, they're so cute when they act fierce. So this is why I call these canine brats "blender dogs." Why blender dogs? It's quite simple. Any dog that can fit in a blender, should. So here's what I propose. Since Big Dogs have a "purpose," I propose to teach them a new trick: To press the buttons on a blender. I have a basset hound, a medium sized dog, which is the kind I like. Guess I'm halfway in between Patrice and some city-dweller with their yappy little dog. I've had Bassets for 27+ years, and I used to raise them. Mine are companions as well as dogs with a working purpose. Polly may be lazy, but she keeps a watch on the other animals we have. However, she's not much of a guard dog. She welcomes all strangers to our property. I have taught her to growl at people as a greeting. (Just the sound. No teeth showing.) It alarms some, until they see her tail wagging. Mine's more of a sleeper and counter cruiser but he will chase rabbits if I let him. He found a pair of baby rabbits in my kids' play area the other day. I got him away before he injured them. Everyone called my last dog "Doormat." That wasn't her name, but that was where she liked to lay, and she wouldn't move. When we buried her, we put her favorite doormat in the grave first. When my buddy of 13 years died from old age ( a HUGE Border Collie) I somehow (sort of) inherited a pair of high maintenance, snow white pampered poodle-ie things which I call my 'Yappers" Besides being Yappers (the noise lasts about 30 seconds) they are living stuffed animals of the incredibly cute type. My first intro to these pampered pets came high in the rocky mountains while outfitting ranger stations in remote areas. One of the grateful recipients of supplies brought to him by pack-horse, carried a little snowball of a doggeroo (Yapper) with him all about the station. The other outfitters learned long ago it was not advisable to joke with this tough, burly man's-man about it! Besides, many of the cowboys on our string had wives and Yappers at home waiting lovingly for them at the end of the mission! When I first moved into my final homestead property, I hired a man to help and warned of my Yappers. He said not to worry, he had a couple at home himself. He showed up a 6 foot brawny man who melted at the sight of my Yappers and reported to me that they quieted down within 30 sec and hung around "lovin' on me' while he worked. What can I say? I am the embarrassed owner of yapping snowballs. They do fine on the homestead. They disappear (100% invisible) into cotton fields to play. They love rolling in cow crap...it's the perfume they prefer. They annoy and deter aggressive roosters with their yapping. God made them to humble us? Our pyrenees got half her genetics from a border collie, so she's black and not quite so fluffy, but ever since the chickens got out and have been laying in every nook and cranny, where she can get all the eggs she wants (leaving none for us ... gotta fix that chicken run!) she's still plenty big. And I love it. I had one very large mixed breed (yellow lab with anatolian shepherd) at 90 pounds, a medium breed called Cattle Master (1/2 border collie 1/8 pit 3/8 kelpie) notice all OCD types, and the accidental Chihuahua. Sadly my large one recently passed, he was very mellow but difficult to handle or pick up if the emergency arose, it did. The medium one at about 45 pounds seems like the right size to handle but due to breed she the chaser, if it moves she is on it, also very smart and will return with one command, a great benefit on a small homestead. The little one has the only benefit that you can pick it up easily, my husband likes him and I see him as just a nuisance (the dog that is). Even if I lived in a small apartment I would get at least a medium one before a yapper. Don't forget, if you are looking for a new companion check out a shelter they are in the most need. My larger one is from there, the medium one was on her way as was the tiny one. Gotta get a better hobby. Sure, as you said, this is meant to be satire, but I couldn't help being a little ticked. Maybe I shouldn't have read the blog post. It was the suggestion at the end that any dog small enough to fit in a blender should be blended to death that really got me. I had a Chihuahua named Max when I was in my late 20s and he was my best friend. He met a similar fate. Some sadistic neighbor kids decided it would be a good idea to steal him from my yard. They then decided it would be a great idea to stick him in their microwave and see how long he lasted. He did not last very long. The kids were never even charged with animal cruelty because they were 9 and 10 years old, and apparently that's too young an age to know that it's a horrible idea to stick a dog in a microwave. I fought and fought for them to be punished, but their mother told me that the BOYS were the traumatized ones! We ended up moving away from that neighborhood, needless to say. It's nearly 15 years later and I'm still not quite past the loss of Max. So reading the last few lines of this post brought unbidden, angry and frustrated tears to my eyes immediately. Maybe that was those horrible kids' motto: "Any dog that can fit in a microwave should be placed in a microwave." Anyway, thanks for bringing back the memories. I'm a loyal reader of your blog, Patrice, but I know not to read any post related to small dogs from now on, now that I know your opinion on them. However small he was, Max was my best friend and his loss still stings. He wasn't yappy, either. He was the sweetest dog you could meet. I hope you understand I would never advocate cruelty to ANY animal. As I said, the essay is satire. I'm very sorry for your loss. I understand that it's satire, and I know you would never do such a thing as advocate for cruelty. You seem like a very decent person. The post just brought back a lot of painful memories for me. Perhaps the "blender" line was excessive, but that's my opinion. I hope I don't depress anyone with my sad story, but that's just the way life is. Good things happen and horrible things happen in their due time. I have had other dogs in the years following Max, some big and some small, and all of them have brought me joy. Still, sometimes I catch myself wishing that Max had been a Big Dog, so that those kids would have had a harder time stealing him away. That's partly why this post brought such emotions to my heart. Currently I have two Yappy Little Dogs, who are Pomeranian-German Shepherd mixes (a brother and sister). They're both pretty yappy and small, but we live in the country far away from anyone who could care. And they would make great alarm bells if an intruder ever decided to attack us. My last big dog was named Roxy and she died two years ago. She was a Great Dane, but I don't think she could have protected me against a flea. "Floppy" is my best word to describe her. I loved her anyway. I don't think I could go for any period in my life, even a few days, without owning a dog. I haven't in probably 20 years. I'm a serious bleeding heart for animals. The blender line is too much for this bleeding heart as well--maybe I've heard too many stories of animal cruelty. Overall though, a well-written and entertaining piece, but then I love dogs both big and small. Max's Mom: Oh my gosh! What a horrifying experience! I can't imagine what kind of parents those boys had to essentially condone their behavior by not allowing any kind of punishment. At the very least, they should have made financial restitution, not that money could replaced Max, but accountability is an invaluable lesson. I shudder to think of what those boys are up to now. And thank you for not being the chronic victim and insisting that Patrice retract/remove any part of the blog and for recognizing that this is your sensitivity. It sounds like you're dealing with it appropriately and on your own terms. So many times these days, that's not the case. I also cringed at the blender reference, having a 'blender' dog, myself. It didn't hit so close to home for me, though, so I am able to see it as satire, knowing Patrice would never actually condone ANYTHING like that. I also have a very large dog. They share equal space in my heart, which will also be broken when they leave us eventually. I agree. Poorly chosen words, satire or not. I have had large dogs all of my life however, due to interesting circumstances, my husband and I adopted a small dog about a year ago. It was our first time having a smaller dog so we were of course very hesitant as we had feared she would be exactly like every preconceived notion of little dogs that we had. I am happy to report that she has a heart and soul as big and special as her larger counterparts and is not the least bit yappy. Yes, we were once one of those people that thought big dogs were the ONLY dogs but no longer. When I hug her and hold her close, she brings me every bit of joy and happiness that my big dogs always did. I am glad we did not let our bias against smaller dogs lead us to turn her away. We love her madly and I can't imagine not having her in our life. From now on, we will always remember to consider the personality of the dog, not the size, when choosing a pet to share our lives with. I am not a dog person. Yes they have many admirable qualities. But I just ask that dogs leave me alone. Oh, and I don’t want to hear them. Fair enough? If it were only that simple. So many neighbors fall out over dog issues. Dog-related problems wreak havoc on society. I’ll bet they are second only to drug-related problems. Ridiculous you say? Look at your local police blotter. I rest my case. What? ‘Not your dog?’ Yea, it is never ‘My Fido’. Bless his little heart. I like big dogs. My husband likes big dogs. We seem drawn to German Shepherds & Rotties. We have two German Shepherds who are very sweet girls once we give the okay. I have no doubt they would protect us if the need ever arose. However, I do think little dogs seem to be excellent alarm systems. We have 3 dogs. A Chihuahua, a bloodhound and a rowdy German shepherd. My husband says that the Chihuahua is our alarm that someone is around, the bloodhound sniffs them out and the shepherd takes care of the situation. Big dogs are real dogs, anything smaller than a Jack Russel is no longer a dog to me personally. Our last dog was a Rot-Lab mix with the colors and bark of a Rot and the body, fur and disposition of a Lab - He was a great dog and is still missed. Our current dog is a cattle dog mix who is spoiled as all get out. At 45lbs, she is still convinced that she is a dainty little thing and loves to climb into our laps. I often refer to her as our 'teacup cattle dog' because she seems to see herself as such. Of course my wife MAY have a purse large enough for her (she's got SO many) I think it would be a stretch for her to carry the dog in a purse. Loved the post, brought a smile to my morning. Many Thanks! I love the Big Dogs too! We had to find a new home for my ranch dog, a Black Mouth Cur, when we hit the road in the RV. We took our Rat Terrier with us as he was older. Now he was a superior little animal! He had dozens of rat kills to his credit and it was only our change of location that stopped the numbers going up! He earned his keep and then some. He died of Cushings our second year out. We got gifted a Chihuahua that was cute, but spoiled. That ended day one! I treated him like I did my Cur, made him behave and he has turned out great! He was 10 when we got him and he made the adjustment well. We even get comments at most parks on how well behaved he is for his breed. I say treat a dog like a dog, and you will have a dog! Not some spoiled brat ruining your life! Just saying. Oh, and I loved this story back in 2010 when you first published it! That was the year we got our Cur, who was named Kaylee and is still in our hearts if not our home. Judy, now in Arizona and headed to Montana in a week. I have been bitten twice, both times by chihuahuas. I have grown to despise the breed. Give me a German Shepherd and I'm in dog heaven. My CC (yes, short for Canadian Club) was the world's greatest dog IMHO. It's been over 20 years and I'm crying as I write this, I miss him so much. I guess this was supposed to be kind of a joke but it doesn't really come off that way. Does anyone really give a fig that we prefer different kinds of dogs? Or, cats, animals, housing, food, clothing, music? That was hilarious. I just hate small dogs, dust mop dogs and Chihuahuas. I want a Border Collie. Actually, I don't want a dog in the house since I have a sensitivity to dogs. I could have written that post myself. The last part was a bit gruesome, but I know you would not approve of a dog being blended. Anyone who thinks their untrained dog is cute is sadly mistaken. I make it plain I am afraid of dogs PLUS have allergy-like problems wherever a dog touches me, and, yes, from the hair. I get tired of people telling me their dog won't hurts me, just wants to be friends, won't bother my allergic tendencies, is their baby. Small dogs have bitten me before, and I am not a person who likes dogs at all, just my dog when the kids had one. Funny post and so true. Little yappy dogs CAN have their place on a homestead. 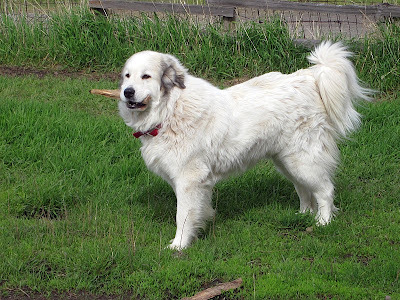 We have a 26 acre place with the classic assortment of farm dogs - LGD, Herding and the American mut. I also have a trio of full size Yorkies. They are the best pest control critters I have ever owned. They survive longer than any barn cat, actually like me (BONUS!!!) and the three of them will take on a herd of rats - Fandral, Hogun, Volstagg. Ron Swanson - "Any dog under 50lbs. is a cat, and cats are pointless." Maybe my mind is twisted, but I laughed at the blender reference. I happen to have yappy miniature dachshund who isn't good for anything other than being cute. That said, I can't imagine life without him. I also have a boxer mix who acts as a warning system if anyone is approaching the house. My Irish Wolfhound chases the coyote away. Medium to large dogs are more practical, but I can't help but like them all.